Candace H. Johnson - for Shaw Media The Tiffany Farms Skellys on display in a picnic scene at the Forbes family home in Antioch. Every day the scene for the skellys change until November 1st. 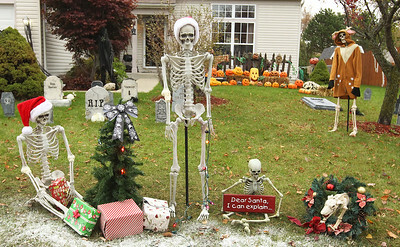 Candace H. Johnson - for Shaw Media The Tiffany Farms Skellys display called, "Christmas Too Soon," in Antioch. Everyday the scene for the skellys changes until November 1st. 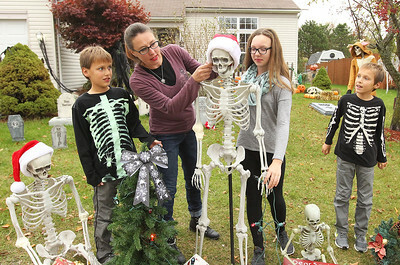 Candace H. Johnson - for Shaw Media Jennifer Forbes (2nd from left) and her children, Caleb, 10, Chloe, 13, and Noah, 10, pose with their skelly display called, "Christmas Too Soon, " in front of their home in the Tiffany Farms subdivision in Antioch. Candace H. Johnson - for Shaw Media Noah Kwasiborski, 10, and his twin brother, Caleb, pose with the "Christmas Too Soon," skelly display in front of their home in the Tiffany Farms subdivision in Antioch. 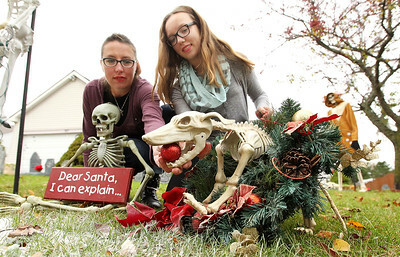 Candace H. Johnson - for Shaw Media Jennifer Forbes and her daughter, Chloe Kwasiborski, 13, pose with their skelly dog for their "Christmas Too Soon," skelly display in front of their home in the Tiffany Farms subdivision in Antioch. 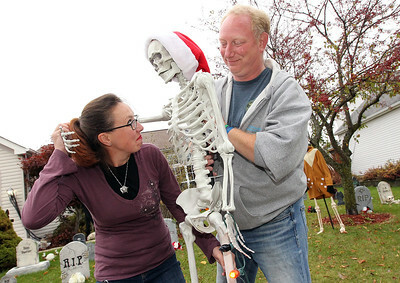 Candace H. Johnson - for Shaw Media Jennifer Forbes and her boyfriend, Paul Simon, pose with a skelly for their "Christmas Too Soon," skelly display in front of Forbes' home in the Tiffany Farms subdivision in Antioch. 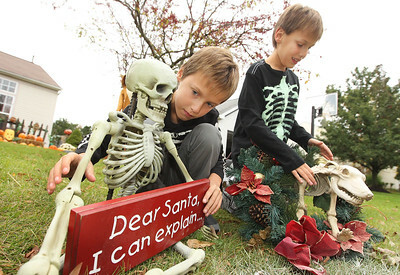 Candace H. Johnson - for Shaw Media Caleb Kwasiborski, 10, poses with one of the hands from a skelly on display with a "Christmas Too Soon," theme in front of his home in the Tiffany Farms subdivision in Antioch. 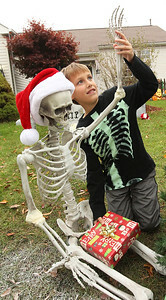 Candace H. Johnson - for Shaw Media Chloe Kwasiborski, 13, poses with one of the skellys on display with a Christmas hat for a "Christmas Too Soon" theme in front of her family's home in the Tiffany Farms subdivision in Antioch. 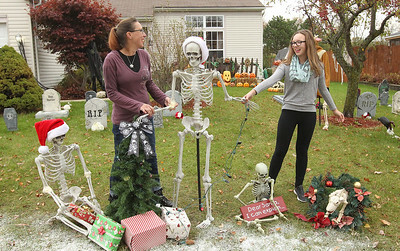 Candace H. Johnson - for Shaw Media Jennifer Forbes and her daughter, Chloe Kwasiborski, 13, pose with a skelly from their, "Christmas Too Soon," skelly display in front of their home in the Tiffany Farms subdivision in Antioch. 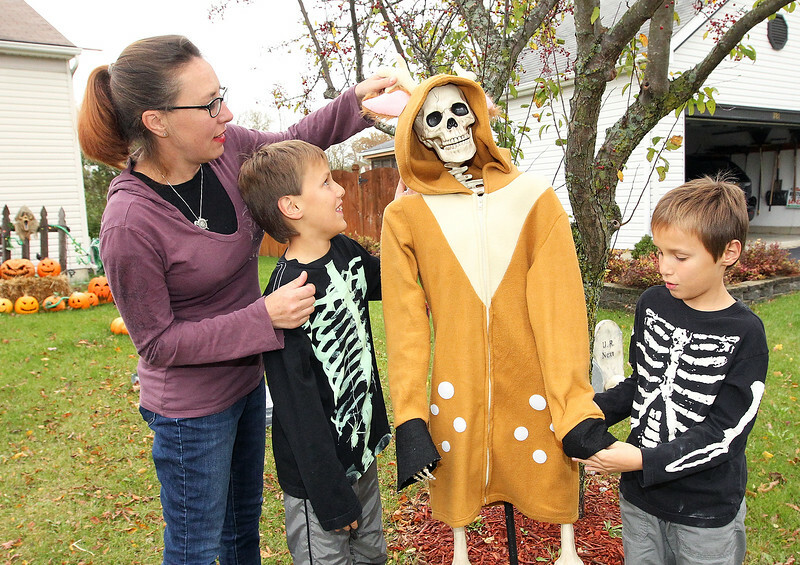 Candace H. Johnson - for Shaw Media Jennifer Forbes and her twin sons, Caleb and Noah, both 10, pose with one of the "reindeer" skelly in front of their home in the Tiffany Farms subdivison in Antioch. Jennifer Forbes and her twin sons, Caleb and Noah, both 10, pose with one of the "reindeer" skelly in front of their home in the Tiffany Farms subdivison in Antioch.